Synopsis: AD 2117. There's something nasty up in Puerto Lumina on the moon, and across Earth people are dying; 3,600 carefully co-ordinated deaths a day, every day and twice on Sundays. It's been going on for months. Someone's laying the groundwork for a nightmare that will encompass the entire world. And they need Joe Dredd taken out of the picture. They need a killer. They need the best. She's the ultimate assassin: born into the horror of the Thai Territories breeding camps and trained with relentless brutality. Then they sliced into her head and they streamlined her mind. She never stops until her designated target is excised. But now, for the first time, she has some ideas of her own. Click HERE for a printer friendly view. 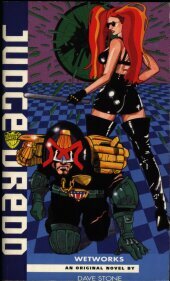 Judge Dredd and 2000 AD © Rebellion A/S 2008. BARNEY is a fan site by based on 2000 AD Online 2001-2008.